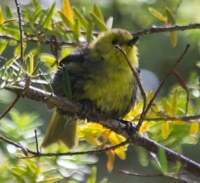 Yellow Heads (Mohua) and Yellow Crowned Parakeet Behavior. At first glance all these two quite different species have in common is the colour yellow, in both cases on the head. But observation shows something else that they share with no other bird species on Ulva. They both will “skritch” like barnyard hens when feeding on the ground. First one leg, and then the other will vigorously scratch at the forest litter to expose ( I Presume) bugs and insects. Neither species is particularly numerous. Yellow Heads have lagged considerably behind Robin and Saddleback numbers, both of them released here at more or less the same time, post rat eradication. . The last estimate I heard was perhaps 200 birds. And Yellow Crowned Parakeet appeared even fewer. Hard to estimate a number, but I would have guessed that there was perhaps one Yellow Crowned Parakeet for every 30 Red Crowned Parakeet. Red Crowned are quite numerous on mainland Stewart Island, or at least around the village, whereas I have only ever seen Yellow Crowned on Ulva. Yellow Head are generally a flock bird, often congregating in flocks of up to a dozen birds, especially at this time of year when they have juveniles. Parakeets also flock, although it’s generally always Red Crowned … understandable when you look at comparative number as above. Flocking is very noticeable around and before Christmas, when we’ll often see up to a dozen or more feeding together, often on the ground. They breed in late summer when the Coprosma fruit comes on stream, and I suspect the flocking is a part of the pairing ritual. But these last few weeks I’ve been astounded by the numbers of Yellow Crowned Parakeets we’ve seen, in flocks, and often 6 or 8 together feeding in a quite small area. Never seen such numbers, let alone together. But what has been really odd is that the Parakeet flocks have always been with a flock of Yellow Heads. Very odd and I’m at a loss to think of a reason.